Hostel Han kohteessa Pristina, Kosovo: Varaa nyt! Centrally located in the heart of Prishtina in Mother Theresa Boulevard just across from the Swiss Diamond Hotel. 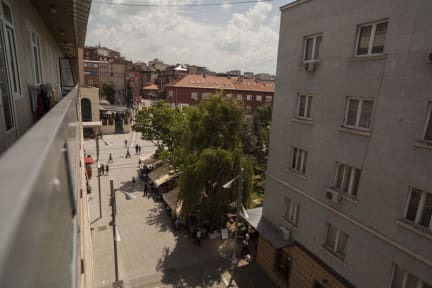 The main Prishtina's attractions are within walking distance, such as National Library, Newborn, Youth Center, National Museum, National Theater, City Art Gallery, and more. Our hostel is arranged comfortably with 24-30 beds in shared and private rooms, all featuring balcony access with a view of the city center. Each bed has 2 electric sockets and curtains for privacy. All guests have individual lockers for their valuables. A common room is available to all guests for relaxing and socializing. The common area features Cable TV, Free internet access, computer for guests. We have three bathrooms for men and women and we provide free towels. We also have a fully equipped kitchen for guests to cook. Our friendly staff is multilingual and will be glad to answer all of your questions and help with anything you may need. The size of our hostel allows for a cozy, personable atmosphere that makes our guests feel at home in Prishtina. There is no curfew at Hostel Han but after 24:00 we ask to be quiet, for sake of other guests and the neighbors.